Cervantes is 198kms North West of Perth. This laid back fishing village boasts white sandy beaches, turquoise waters and great fishing! Explore the mystical Pinnacles are Nambung National Park and photograph the eerie desert limestone formations not found anywhere else in the world. 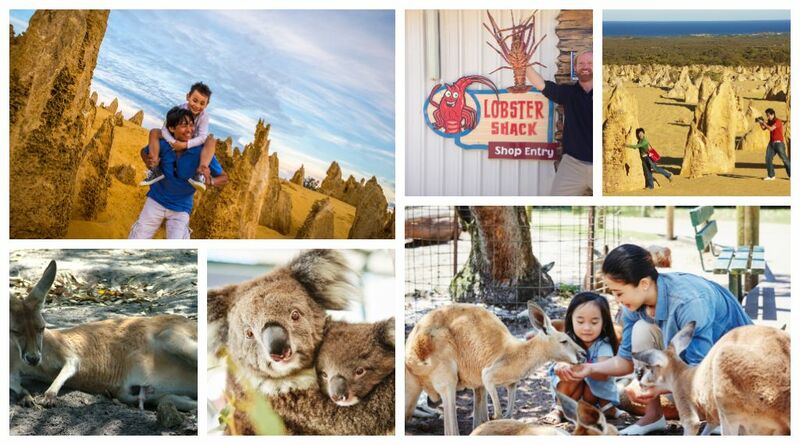 Enjoy a visit to Caversham Wildlife Park in the Swan Valley Wine Region and enjoy hand feeding the kangaroos and have your photo taken with a koala and wombat. Please email for a QUOTE – bookings@hgltours.com.au or complete a quote form. NOTE: Our driver is able to take you on a loop road through the Pinnacles (bigger buses have to stay in the car park and passengers then walk by foot) but as our bus is a smaller 14 seat bus, so we are able to take you off the beaten track so you can then get some great photos in between the Pinnacles and from the viewing deck. Visit Cervantes, the laid back fishing village and enjoy lunch at The Lobster Shack (enjoy a Western Rock Lobster, prawns or other seafood) – at your own expense (11:30 – 12:30pm). OPTIONAL: While waiting for lunch enjoy a self guided Factory Tour with multilingual audio guide, so guests can take the tour at their own pace (takes approx 20 mins). Watch a video presentation and then walk along the overhead walkway where you’ll stand above live holding lanes that can hold about 20 tonnes of lobster. Factory Tour at own expense – $10 per person. In Spring see the wildflowers (Sept – Oct). Visit Caversham Wildlife Park – Farm Show (3pm – watch sheep shearing, crack a stock whip, milk a cow, bottle feed a lamb, meet a stockman on horseback, swing a billy, watch sheep dogs mustering the sheep – all the excitement of a true blue Aussie farm), hand feed the kangaroos, meet Wombat + friends (3:45pm show), penguin feeding (4pm), photo opportunity with a koala (4:15 – 4:30pm), and see other Australian Wildlife (cockatoo, black swan and emus). Return drop off at accommodation by 5:30pm. * Tour price quoted in AUD. We had a great trip with an awesome tour guide, Mr Franz. We would certainly recommend Happy Go Lucky Tour to our friends. Thank you Mr Franz for being an excellent tour guide. We would like to thank the team at happy go lucky tours. Highly recommended. Thanks.